This entry was posted on January 14, 2015 by elisabethakinwale. It was filed under Fitness, Parenting, Pregnancy . This article really hit home for me. I had my son 6 months ago, and since I found out I was pregnant I was fearing the changes my body would go through, and if I’d ever get my fitness back. The point you make about never getting my old body back, because it is a new body was good to hear for me. It’s true, there is no going back; just forward. Thank you for reminding me that this change is OK and not necessarily a bad thing. This was a great post, and a good reality check for me. Thank you! As a soon to be mom (25 days!) who helped get her team to the Games this past year (though because of my pregnancy I chose to give my spot to someone else), I have been struggling lately with everything you just touched on. So, THANK YOU! I desperately needed this. I cannot wait to meet my baby girl and while I hope to “get my body back” soon it’s nice to hear that someone I look up to and admire cherished simply being a mom for a while. thank you so much for posting this!! I’ve been extra emotional lately and had a mini meltdown at the box yesterday! I am a first time, later in life, mom. I had a c-section and I worked out every day until my delivery. I am still nursing my daughter who just turned two! the changes my body has gone through and is still going through frustrate me when I go to the box but then I think of my little one and nothing else matters. I am so happy you posted this, it gives me strength to continue towards my goals while reaffirming my exact thoughts, she’s only going to be little once. Being a guy I don’t know much the issues described by mother & world class athlete Elisabeth Ak. But I’ve read and was amazed by the Wilma Rudolph story > Gold medal 100m sprinter as a teenager in 1956, pregnant in 1958 to the dismay of her coaches, and then WON olympic gold again a second time in the 1960 Olympics less than 2 yrs after giving birth. Amoung the strongest ladies at the gym I attend is a 40 yr old mother. Is it possible that being a mother makes women stronger somehow in the long run ? Doesn’t Elisabeth usually take at least one 1st place in strength oriented events at Regions and Games ? It definitely helps to have a partner, who is fantastic support and understands the need I have to feel and be fit. I’m not an amateur athlete but I do want to be fit and healthy and spending time being outdoors in all kinds of weather is important also to ones state of mind. It’s also important that I set this example for my kids. I had my son 6 years ago (my daughter 9) and I still haven’t got my body back. I have that little extra “tummy” and wider hips. I have been talked about in clothing stores by teenage girls saying I was “too fat” to shop in the store or “no clothes” would fit from that particular shop. I have tried the gym but with me being a full time single mum and a full time uni student I don’t find the time to even go to the gym.. Thank you for posting this….I know I am not “fat” but sometimes when the above happens it makes you feel down.. Thanks for sharing. 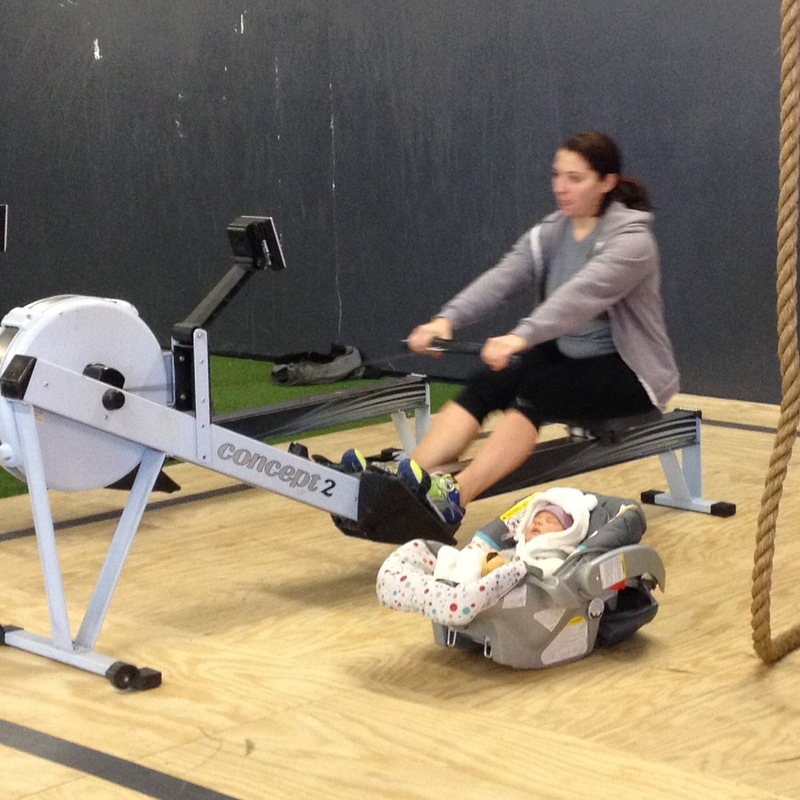 I’m 8 months pregnant with my 2nd son and have been Crossfitting throughout the entire pregnancy. I’m so looking forward to hitting the gym hard with less poundage lol. Your story was on point and so true. My daughter is 16 and I’m still working on getting my pre-pregnancy body back. Life is what it is and I haven’t been where I could focus on myself much in the past 16 years but I didn’t give up on that and now that I’m back in the gym regularly, I can see the goal, it won’t be long. I am now way up the masters level ladder but it doesn’t matter as long as I stay on the ladder. I shared this in Facebook and one of my older athletes told her story. I can’t thank you enough Elisabeth as you replied to her. All my athletes know how highly I regard you as an athlete, woman and role-model (I often remind myself to be the type of role model you are for me. It’s a work in process…). This particular athlete has been struggling lately, thank you for giving her a boost! Wow, I love this. 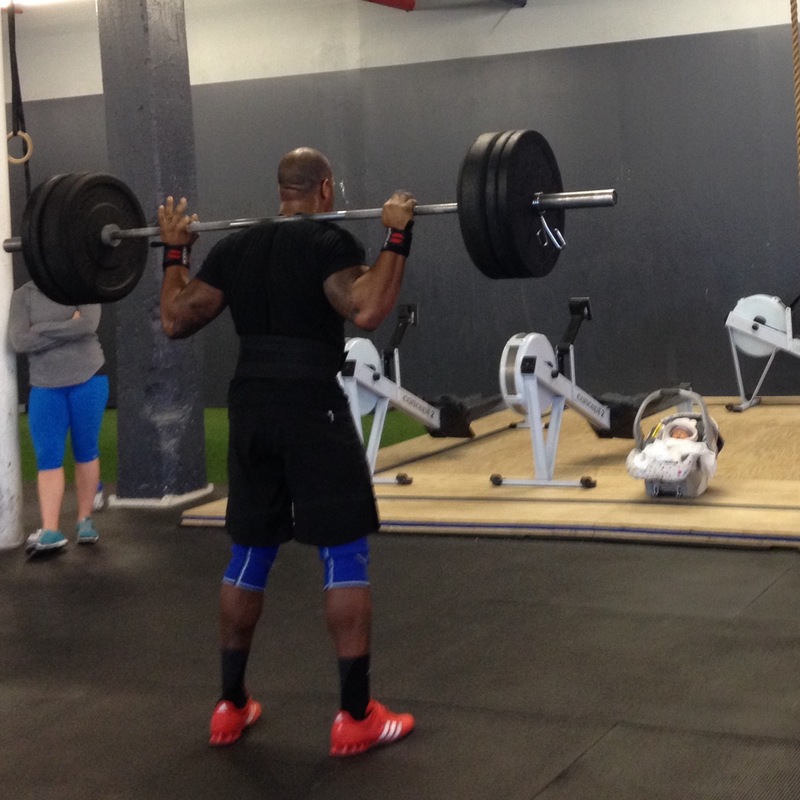 As a mom to be in 27 days, I’ve stayed in crossfit the whole time…some weeks were 4x, some were 1x a week! I had to learn to give myself a break and remember to be in awe that I’m making a person! 🙂 And once she’s here, I plan on heading back to the gym, and I’ll be glad to not have that internal wall ball in me…but a little sad too. I just have to remember to go slow and enjoy the journey. Great read! I needed to hear this today. My son is due any day and it just so happens in the last 2 days I’ve started getting stretch marks on my stomach. I know it’s vein and selfish however it was making me a little sad and just really wishing he’d decide to come before they get worse. Thank you for putting things in perspective for me, I really needed it today. Thanks for posting! My friend sent it to me for my wife. She’s struggling with body changes, light lifts and not feeling herself. She’s never been more beautiful though. Thanks again! Great article for all those current mothers and future mothers in out CF Bios family. Thank you so much for writing such a brilliant and well thought out piece. I am currently pregnant with my 3rd child and am yet again beating myself up about my training regime, eating, body, etc… despite knowing very well how wonderful my babies are and how much I love being a mother! We (women!) can be so hard on ourselves so I’m very grateful to hear your encouraging and happy words. I dislike people using the word ‘back’ when referencing our bodies… I want to look forward to what my body is going to do and what it will become. Thank you! Thanks for sharing. I just went through this! (My son will turn 1 in March). Love to hear other fit women’s stories of how they handle pregnancy and raising a kid. This was a great thing for me to read today when I have been so discouraged that I haven’t yet been able to “get back in there”. It was easier with my first baby, working out until I delivered and right back at 6 weeks. Now, with baby #2 and a 2 year old, I’m lucky to get in the box twice a week. And then I can’t get my head in it worrying about my kids with dad the whole time. But this made me realize I really do have my whole life to get back to where I want and such little time nurturing these little humans. Thank you for this! You are amazing! I always enjoy your posts! As a 59 year old I can attest that the body will change as we get older and we must embrace that. Pregnancy is a big change on the body and also must be embraced. It is hard when the body changes, for whatever reason, to adjust to the realization that we can’t do what we were able to do in the past. There’s a reason why we don’t see 70 year old Olympic athletes!!! LOL Working through the changes, that is the key ingredient, not judging oneself on past accomplishments, but still getting the workout done at whatever level we can do it. I’ve had a lifetime of running, skiing, jumping, karate, hiking and biking, now with two knee replacements, I do what I can! So don’t be so hard on yourselves, most of you are young and time is on your side!!! Thank you! I’m 39 and 8 months along with #3. I started crossfit about a year before getting pregnant this time around and was probably the fittest I’ve been when I got pregnant. I still have a long way to go, but continued exercise, even if scaled, has made this an easier pregnancy and I feel much better about my body (and my first two were easy). It’s a tough balancing act between taking it easier for the sake of your baby and still keeping a healthy level of fitness, staying active for the sake of your baby. My coaches and fellow athletes have been incredibly supportive and I’m excited about getting back, slowly and moderately, after i have the baby. I expect to be fitter and stronger at 40 than I ever was at 20 or 30! This post was beautiful. It made me think of when I had my little girl. Some woman are so hard on themselves as I was when I was pregnant sayin Im big or not fit enough even after having her I struggle to lose weight and be fit again but cmon we had a baby and we made a beautiful life. Cant no one tell us otherwise. Woman rock and our bodies are heavenly!